"Alexa, flash the lights when it’s time for The Grand Tour"
"Alexa, where does James May buy his clothes?" "Alexa, switch the Fire TV to Amazon Prime Video"
"Alexa, how much does a Rimac Concept One cost to repair?" "Alexa, play Danger Zone when James May hits 40 miles per hour"
"Alexa, which car holds the track record at the Eboladrome?" "Alexa, tell me what you know about this week’s Grand Tour location?" "Alexa, what’s the flight time for New York City?" Build The Grand Tour Alexa Skill and win an NYC adventure for four. With The Grand Tour Season 2 now showing on Amazon Prime, we’re searching for the funniest, craziest, downright most audacious Grand Tour Alexa Skills to accompany the show. We need dreamers and developers like you to deliver the adventure, high jinx and pioneering spirit of The Grand Tour to Alexa users around the world. All you need to do is submit an idea! There’s no time to lose. Grab your smartest mates and get your thinking caps on. Be bold, be big, be brilliant. Alexa Skills bring intelligent features and exciting integrations to smart devices like Amazon Echo, Echo Show and Fire TV. With the second season of The Grand Tour now available on Amazon Prime Video, it's finally time for Clarkson, Hammond and May to meet Alexa. We want your ideas for The Grand Tour Alexa Skill – brave and pioneering concepts that bring the adventure, excitement and energy of the show to Alexa users around the world. Form a team (or go solo), head to the shed, sharpen your pencils and brainstorm your idea for The Grand Tour Alexa Skill. The Grand Tour team will review all submissions and select ten finalists to move forward to the development stage. The finalists will then have 6 weeks and development support from the team at Amazon to build their Grand Tour Alexa Skill. Answer the questions below, to bring your Grand Tour Alexa Skill to life. How did you hear about the contest? * Please select	Facebook	Amazon developer center	Course leader / ambassador	Amazon ambassador	Other	 How did you hear about the contest? Use the official Alexa Grand Tour Contest submission form to enter. Top tip: take a look at the form first to help structure your ideas. The contest is only open to full or part-time students in the United Kingdom, over the age of 18. You will need to enter the competition using an email address from a recognised educational institution in the UK. You can enter the competition individually, or as a team of up to four people. Each member of the team will need to register, when the idea is submitted. Entrants can submit more than one idea, but you will only be eligible for one prize. What makes your idea special? How will your skill continue to interest The Grand Tour fans each season? What’s so clever about your skill? The same criteria will be applied to select the overall contest winner. The Grand Prize is a trip to New York City for four adults. If your team comprises less than four people, you can invite one or more guests to make up the numbers. Return train travel from winner’s nearest mainline rail station to London, Manchester, Edinburgh or Dublin. 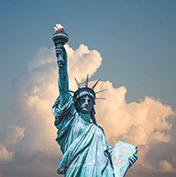 Return flights to New York from London, Manchester, Edinburgh or Dublin. Return private airport transfers in New York. 2 nights’ luxury hotel accommodation (4* min) in Midtown or SoHo, sharing four single rooms or two twin rooms. 2-hour tour of NYC in a classic convertible and dinner at a Brooklyn restaurant (up to £450). Each of the ten teams selected as finalists will receive one Amazon Echo Show (per team), to be posted to a designated team member. All eligible members of a team that correctly submits an idea will receive a Grand Tour T-Shirt. This will be posted to the address(es) on the submission form, within 2 weeks of the finalists being announced. When is the deadline for competition entries? Is this a devious way to get students to buy an Amazon Echo? Ha! Absolutely not. You’re obviously more than welcome to buy an Echo if you want to, but all your skills can be tested for free using Echosim.io. So all you need is your imaginations and a keyboard (preferably, one attached to a computer. With the Interweb. Er, and some electricity). What support will Amazon provide for finalists? A dedicated Slack channel for support questions. One live webinar with Amazon developers to progress skill development. One Q&A session with Amazon developer evangelists. Branded assets from The Grand Tour team. Note that assets can only be used in the final winning and published skill with permission from Amazon. Check out the following developer documentation, tutorials & APIs to help you create your Alexa Skill. 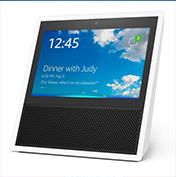 All entries should be optimised for the Amazon Echo Show. The promoter is: CatchyMonkey Business Limited, T/A Catchy, (company no.7116321) whose registered office is at 6 Kingsmead Square, Bath BA1 2AB UK. The competition is open to full time students of the United Kingdom aged 18 years or over excluding employees of Amazon Media EU Sarl and Amazon Instant Video Limited (collectively, “Amazon”), Catchy, “Media EU Sarl (or their respective affiliates)” and their close relatives and anyone otherwise connected with the organisation or judging of the competition. Entrants (“Entrants”) must enter as part of an “Entrant Team” consisting of one to four students from a single UK University. An Entrant is only permitted to be part of one Entrant Team. Any Entrant that is part of more than one Entrant Team may be disqualified and his/her corresponding Entrant Teams may be disqualified as well at the sole discretion of the promoter. Only one member of the Entrant Team may submit an application on behalf of an Entrant Team but all those listed on the application will be deemed as Entrants. Entrant Teams are permitted to submit more than one entry but no more than one entry will be put forward to the build phase. The promoter reserves the right to verify eligibility and to adjudicate on any dispute at any time. Competition entry period begins at 00:01 (GMT) on 17th November 2017 until 23:59 (GMT) on 10th December 2017 (the “Entry Period”). After this date no further entries to the competition will be permitted. at Alexaandthegrandtour.com and follow the instructions to complete the online entry form using their academic email address eg your.name@UNI.ac.uk to submit an idea for a Grand Tour themed Alexa Skill (the “Entry”). No Alexa-enabled device is needed to submit an entry. 10 Entrant Teams (the “Finalist Teams”) will be chosen on Monday December 18, 2017 by a panel of Catchy and Amazon judges appointed by the Promoter. The 10 Finalist Teams judged to have the best entry will be asked to go ahead and build their Skill ready for final judgement. Each Finalist Team will be receive an Amazon Echo Dot and Amazon Echo Show to assist in building and testing their skills. Each Finalist Team will be allowed 6 weeks to build their skill. During the Build phase, finalists must give a weekly update on progress to Catchy. The Finalists are required to (i) create an Amazon Developer account (by going to the Developer sign-in page at https://developer.amazon.com/ and following the instructions) and accept the App Distribution and Services Agreement (located at https://devportal-eu.amazon.com/registration/agreement.html?id=M3JTMJZZHB11P3) and (ii) make their Skill available for judging by clicking on “Beta Test Your Skill” in their Amazon developer account and adding the email addresses of the judging panel. These email addresses will be confirmed during the Build phase. Skills must be emailed to the judges for final judging on or before 11:59 GMT Sunday January 28, 2018. One Finalist Team will be selected by the judges as the grand prize winner of the competition (the “Grand Prize Winner”). 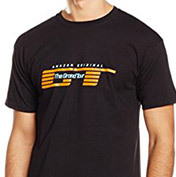 Amazon may, in its sole discretion, make available to the Grand Prize Winner Amazon and The Grand Tour related materials (including, without limitation, trademarks, logos and talent names) in connection with the distribution of the Grand Prize Winner’s Skill. All other Finalist Teams may publish their completed Skills subject to standard Amazon approval and without use of Amazon and The Grand Tour related materials (including, without limitation, trademarks, logos and talent names). The Competition starts on 17th November 2017 and ends on 12th February 2018. The Competition phases are noted in the calendar below. The dates are approximate and are subject to change at the Sponsor’s discretion. The Grand Prize is for four people. For teams of less than four, entrants from the winning team may invite guests to make up the four. Entrants are responsible for valid passport, and any other necessary travel documentation, including but not limited to, appropriate visas. Travel insurance is subject to restrictions and the terms and conditions of the insurance provider. It is the responsibility of the winner and/or their companion(s) to meet any additional costs relating to obtaining insurance cover for any pre-existing medical condition and for any additional costs as may be specified where the winner and/or their companion(s) are aged 70 or over. The winning team and two runners up teams will be decided by the panel by Monday February 5th 2018. The winning team and runners up will be notified by email within 28 days of the closing date. If the winning team cannot be contacted or do not claim the prize within 14 days of notification, we reserve the right to withdraw the prize from the winner and pick a replacement winner. The promoter will notify the winners when and how the prizes will be delivered. All prizes are as stated and no cash or other alternatives will be offered. The prizes are not transferable. Prizes are subject to availability and we reserve the right to substitute any prize with another of equivalent value without giving notice. The competition and these terms and conditions will be governed by English law and any disputes will be subject to the exclusive jurisdiction of the courts of England and Wales. The winner agrees to the use of his/her/their name(s) and image(s) in any publicity material, as well as their entry by Catchy or Amazon or their respective affiliates. Any personal data relating to the winner or any other entrants will be used solely in accordance with current UK data protection legislation and may be disclosed to Amazon and its affiliates in which case such personal data will be treated in accordance with Amazon's Privacy Notice. Any such personal data will not be disclosed to a third party, other than Amazon or its affiliates without the entrant’s prior consent. Waiver of Liability. Neither promoter nor Amazon will be responsible or liable for: (i) any failure to receive entries due to transmission failures or other conditions beyond their reasonable control; (ii) any late, lost, misrouted, garbled or distorted or damaged transmissions or entries; (iii) any disruptions, injuries, losses or damages caused by events beyond their reasonable control; or (iv) any printing or typographical errors in any materials associated with the Competition. General Release. By entering the Competition you release Amazon, relevant third parties, and each of their respective affiliated companies, directors, officers, employees, representatives and agencies, from any liability whatsoever for any claims, costs, injuries, losses, or damages of any kind arising out of or in connection with the Competition or with the acceptance, possession, or use of any prize, except as prohibited by law. Copyright. 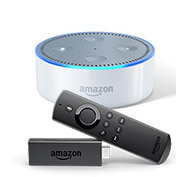 Amazon, Alexa, Echo, Fire and all related logos are trademarks of Amazon.com, Inc. or its affiliates.by Amazon.com, Inc. and its affiliates.